Happy Easter to The Bahamas Investor readers! I am a financial planning, tax, legal or estate professional. I am an investment or money management professional. I work in the financial services industry. I already use offshore financial services. I don't use offshore financial services but want to learn more. 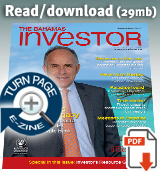 I am interested in ordering free additional issues of The Bahamas Investor for colleagues or clients. The Ministry of Tourism is spending around $15 million on a multi-media advertising campaign targeting niche markets. Watch an interview with Minister of Tourism Obie Wilchcombe. Minister of Financial Services Ryan Pinder views the "A" rating for the Securities Commission of the Bahamas as monumental, as it follows the recent passage of the Securities Industries Act. He adds that The Bahamas is the first country in the region with such a rating. January 1 marked the release of the new issue of The Bahamas' premier business and finance magazine The Bahamas Investor. Pick up a copy today.